Kemper GmbH, German manufacturer of the groundbreaking Kemper profiling amp has released, for free, a pack of 50 profiles produced by Ton(e)hammer. 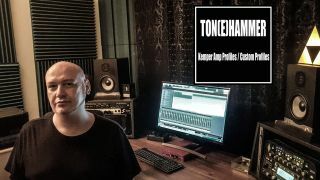 Following the emergence of amp emulation tech, Ton(e)Hammer was the first independent profile production house to emerge, founded by Lars Lüttge (Deadlight Studio) and Frank Kölbl, and has quickly become known for refreshingly aggressive Metal and Rock profiles. Their profiles have been used by many heavier acts, such as Katatonia, Eskimo Callboy, Benighted, and Any given Day. The newly released free pack features profiles of sought-after rigs, all featuring independently captured amp and cabinets, thus allowing you to layer and swap cabs to your demonic heart's content. For more info and to grab the pack, head over to Kemper's download centre.